Capturing penta-coordinate carbon! (Part 1). It’s penta-coordinate carbon Spock- but not as we know it! Capturing penta-coordinate carbon! (Part 2). In this follow-up to the previous post, I will try to address the question what is the nature of the bonds in penta-coordinate carbon? This is a difficult question to answer with any precision, largely because our concept of a bond derives from trying to define what the properties of the electrons located in the region between any two specified atoms are. Such a local picture is somewhat at variance with the idea of electrons being delocalized across the entire molecule. Two procedures for analyzing the local electronic behaviour which we have been using recently are AIM (Atoms-in-Molecules) and ELF (the topology of the Electron localization function). There are many useful published articles which elaborate these concepts; if you want to read some of them, start at DOI 10.1021/ct8001915 and follow the cited articles. 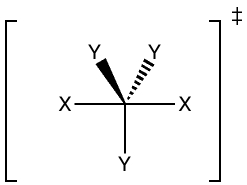 Firstly, the AIM analysis of the system below, where X=cyclopentadienyl anion and Y=CN. This is shown below. If you click on the image, you will see a rotatable version of this diagram. The coloured (red, yellow and green) dots represent so-called critical points in the curvature of the electron density function ρ(r). The red dots are known as bond critical points, or BCPs. 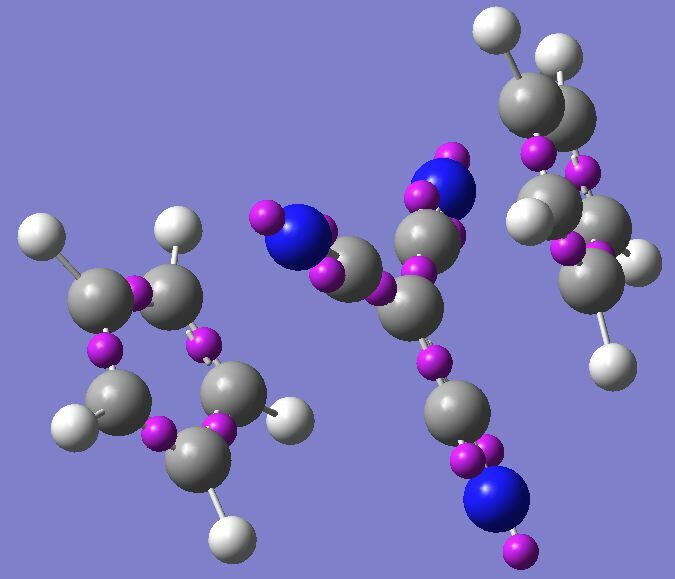 These (almost) always are found along the line connecting two atoms which we tend to refer to as a bond. 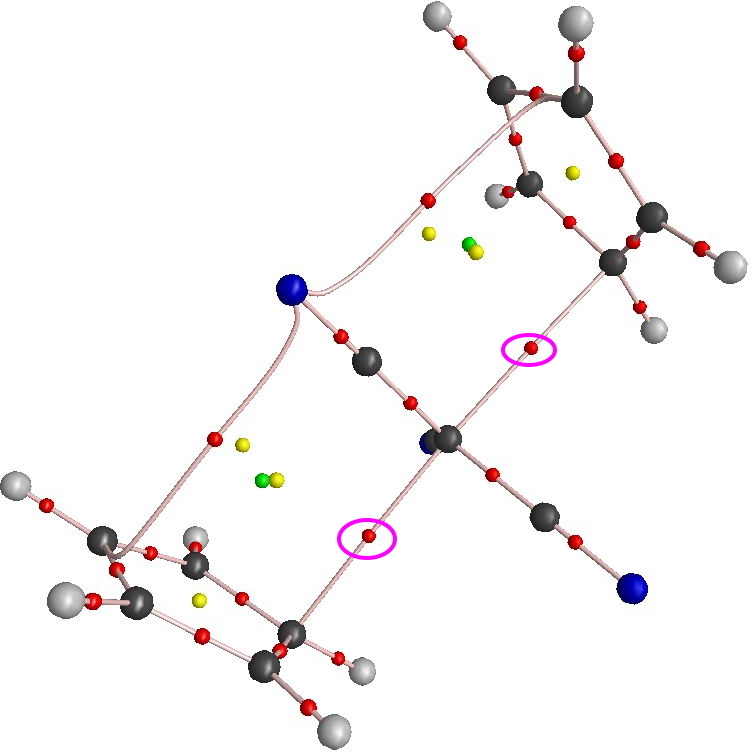 You will see two that have been circled in the diagram below, and these appear to show a bond connecting the central 5-coordinate carbon atom and a carbon of each of the cyclopentadienyl rings (which themselves are revealed as rings by the presence of a yellow dot). Indeed, that central carbon atom does seem to have five red dots radiating out along lines connecting it to five carbon atoms. Here, the electron density ρ(r) was actually measured using X-ray diffraction, and found to be ~0.017 for bond critical points found connecting the central carbon and each of the four oxygen atoms. The length of these “bonds” was measured as ~2.7Å. The agreement with our frozen transition state is quite striking. One can go a little further and inspect the (2nd) derivative of the electron density at the bond critical point, termed the Laplacian, or ∇2ρ, which tells what kind of “bond” one might have. The measured value of ∇2ρ for the system above was ~0.06 au, and the calculated value for our pentacoordinate system is 0.04 au, which again suggests we are dealing with a very similar interaction in both systems (one hypothetical and calculated, the other real and measured). The use of the term interaction was deliberate. It is less loaded than the term bond. 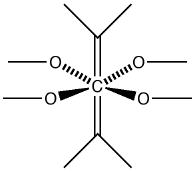 Thus the value of ρ(r) for an undisputed C-C single bond is around 0.28 au, around ten times higher than our putative bonds. Since we do not really wish to grace a ρ(r) value of 0.022 with the term decibond (or any other fraction of a single bond) perhaps it is best to call it just an interaction, and leave open the question of how strong that interaction is! So, despite the AIM analysis finding a bond critical point, we shall settle for interpreting that merely as an interaction, and not a bond! Well, is an interaction (or come to that, a decibond) worthy of counting towards a coordination? Perhaps! The most striking difference with the AIM analysis is that that the central carbon is surrounded only by three, not five disynaptic basins. The BCPs found for the two di-axial interactions have no counterpart in synaptic basins. Of course, that does not mean that there are no electrons that can be integrated in that region, just that the curvature of the density in that region is not sufficiently well defined to define a bounded volume of space which can be clearly integrated. Perhaps that condition is what we might mean by a bond! The three disynaptic basins that do surround the central carbon integrate to a total of 7.85 electrons, which is close enough to 8 for us to say that this carbon is NOT hypervalent! So what is our final conclusion? The frozen SN2 species is not hypervalent. It could reasonably be said to be coordinated by three bonds, and two diaxial substituents that interact with the central carbon weakly. Perhaps rather than penta-coordinate, the central carbon could be described as pentacoordinaloid! This entry was posted on Wednesday, September 23rd, 2009 at 10:21 am and is filed under Hypervalency, Interesting chemistry. You can follow any responses to this entry through the RSS 2.0 feed. You can leave a response, or trackback from your own site. 1) The first is the relevance of addressing bonding in a transition state. For the “pentavalent” carbon in the SN2 mechanism, two of those bond critical points for the transition state are along the direction of reaction coordinate, along which the transition state is a maximum in energy. A safe and undeniable criterion/approximation for a “bond”(we do not specify here whether it is weak covalent or ionic) is surely the structure being a local minimum on a potential energy surface.So it does not perhaps make much sense to talk about bonding and hypervalency of a carbon in the SN2 transition state. 2) About the hexacoordinate carbon structure, some technicality. First of all whether the structure is truly a local minimum in the gaseous phase calculation and there are no eigenvalues for the energy Hessian matrix which are close to zero eventhough they are positive? 3) Since the structure has been synthesized and its experimental electron density is available and if this has (3,-1) critical points showing hypervalency of the carbon, ( just the presence of a (3,-1) CP maynot be enough, one has to check the Laplacian of the density and even the density derived ELF basins), the definition of the bonds and valency depend on the choice of mode of analysis. One could even look at the critical points of the electrostatic potential.Perhaps a criterion for bonding based on just energy suffices, and then one has safe criteria for bonding. 1. I would argue bonding occurs in transition states as well as ground states, its just that it might need different classification. In this instance, the first diagram labelled “SN2 transition state” is actually misleading. It is indeed a minimum, and not a maximum in the potential surface. That indeed was the original point, that Bickelhaupt et al reported a minimum with Astatine, and I suggested cyclopentadienyl as a more realistic nucleofuge. Indeed, it too forms a minimum, and so in effect is a “stabilized” transition state, one which has the geometry of the transition state but is a minimum (an inverted potential energy surface). 2. The hexacoordinate structure is also a true minimum, and indeed derives from a crystal structure (for which AIM of of ρ(r) has been performed). 3. Other structures have indeed had Laplacians measured, [1.1.1] propellane springs to mind (on which I have blogged elsewhere). I believe, because the Laplacian requires high angle X-ray diffraction, it is often not measured very accurately. Indeed, in my post on the topic, I lament the fact that the observed Laplacian along the central C…C bond for [1.1.1]propellane is probably in considerable error.